author. Today’s featured book is Twenty-Five Years Ago Today by Stacy Juba. a talented artist who expressed herself through haunting paintings of Greek mythology. present, costing her love, her career, and ultimately, her life. for friendship and safety with the Fairwood pack, she accepts. himself as Dot’s protector and becomes more than a friend. noms de plume. Here’s her take on Alpha Males. when it’s the exact opposite of what he actually wanted her to do. those times she ignores him and goes off to take care of business by herself. child…or a puppy…a kitten… You get the drift. mate needs to have. She can’t be too stupid to live. 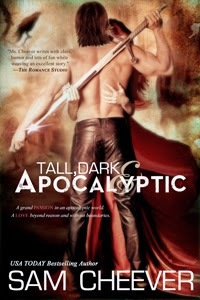 He’s a warrior, a bounty hunter in a world turned upside down. their bodies are creating…and not lose themselves in the process. I am Mira-nell and am almost four summers old though Mother says I am threee. I travel with her on the Wayfarer’s Road. Folk think I’m strange, but I know more than most. I am too small! My mother wants me to learn her bowdancer ways but there is too much of the world to explore. I just do not want to do it always from the Wayfarer’s Road. Cannot interesting folk come to us? I wonder if I will grow old on this road and be as lonely as my mother is. She does not tell me her heart hurts, but I see it. There are mean folk on this road. Mother thinks I am too young to understand, but I know how they look at me and at her. I am afraid that one day she will be gone and I will be alone on this road. My mother, Jan-nell, loves me most, but we have met a magical bardsinger on this road who tells the best stories. But he is not as grown up as mother and me. Mother says I am quick-witted and so does Khrin, the bardsinger. He makes me laugh. There has only been Mother and me. Khrin says we are family but Mother says we are not. I do not understand that. But I would like to live with Khrin. He cannot keep me as safe as Mother does, but he tries. Mother has taught me much about wild foods on the Wayfarer’s Road. 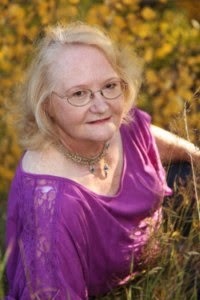 I observe what herbs she uses to heal people in the towns and farms and to help new mothers bring babes into the world. I have not seen a birth yet, but I have heard many. I think people show who they are and what they intend, not by words but by the look of their eyes or the way they move. Mother tells me good things about my father—how quick-witted he was and that is why I am so. She tries not to tell me bad things, but I overheard her speak to Khrin about him. I would not wish to meet him on the Wayfarer’s Road. I do not think he is a good man. I am gloriously happy. But folks will have to find out for themselves. You have the length of a tweet (140 characters) to describe yourself as a writer. Let’s see what you can do. I come from a long line of liars and storytellers, and I have an avid curiosity. I collect odd facts and experiences and tie them together in intuitive leaps with words. I’m a retired freelance journalist. I made a living by writing other people’s stories. I felt it was time to write my own—and not stories about me, but stories from my imagination. 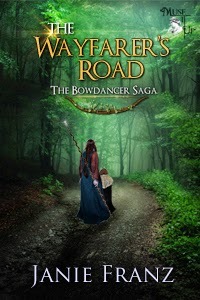 The Wayfarer’s Road, where Mira-nell first appears, is the second book in The Bowdancer Saga. The first three books (The Bowdancer, The Wayfarer’s Road, and Warrior Women) are being re-issued by my publisher, MuseItUp Publishing, to join The Lost Song Trilogy, books 4-6 of the series. They will all be under one roof this summer. Later, I plan on three more books—one that continues Jan-nell’s life and one each for her children. (Yes, I did say children.) The entire Bowdancer Saga follows Jan-nell’s life from her village on the plains and out into the wide world as she searches for meaning and belonging. I appreciate every person who has read (and those especially who have reviewed my books). An author will write because she (or he) must. But those stories might as well be hidden in a cave in some dark corner of the earth if they are not discovered and read. Only then do they come alive. The fifth book of her Bowdancer Saga, Refrain (the second book in The Lost Song Trilogy), was a Top Ten Finisher for Best Science-Fiction and Fantasy Novel in the Preditors and Editors Readers Poll 2013.
bard, carrying secrets and the hope of belonging. with the priceless chance at hope for her and her child to belong. “The Wayfarer’s Road,” book #2 of the Bowdancer Saga, does just that. of Island Song and The Lonely War. places.” – Stuart Clark, author of Project U.L.F and Project U.L.F: Reacquisition. Road with great anticipation. Once more, author Janie Franz did not disappoint. only cautiously trusts the other. read about my books or connect with me at any of the links below. threat of her abusive, ex-con father finding them has made that almost impossible. it, the redheads slowly rewrite the code around his heart. to keep them safe…and really be what they need? A forever cowboy? buddies get their own books and felt it was his turn. for a tortured hero, and if he’s military to boot, all the better. TV shows? Which are you favorite? the first of four Wyne brothers to find the right woman. cowboy. He doesn’t do relationships and she’s looking for forever. she thought she knew — about herself and the people around her. 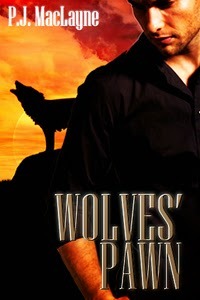 including iBooks, B&N, KOBO, AllRomanceEBooks. Gift is my first novella-length book. and with Logen’s, as well. I hope my readers are, too. I love reading historical romance, especially Scottish historicals. I grew up reading science fiction, so science fiction romance is a lot of fun, too. have more of a list than you have room to include. even by the end of this month. Highland Troth is Jamie Lathan’s story. Here’s the info about it. as children, but after she was called home, he never expected to see her again. way to ensure Caitrin’s future, even if it means sacrificing his own. the Highlander is going to be fabulous! 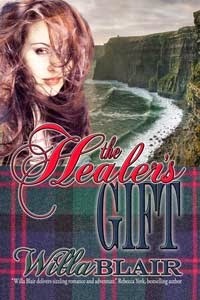 Please tell us about your latest book, Healer’s Gift. Healer. But her victim did more than heal Coira’s fatal wound that awful night. talent in time to save him and their clan from those intent on destroying MacDugall. will soon be joined by more novels of adventure and romance.